Kitty comforts: How cat-friendly is YOUR veterinary hospital? Is your veterinarian’s place a cat-friendly environment? Is the waiting room divided so that dogs live on one side while cats rest more comfortably on the other? Does the staff seem to recognize when your cats are unduly stressed? What other concessions do they make by way of making your kitty’s visit as kind and gentle as possible? Before I embark on this topic, let me first come clean: Though I work in a hospital that caters to both dogs and cats (and my affinity to both species means I wouldn’t have it any other way), I have a serious soft spot for cat-only hospitals. These facilities are ideally suited to the unique stresses cats suffer in a veterinary environment: No barking dogs, no untoward canine aromas, zero extraneous details not geared to their special needs as felines. Yet cat hospitals are not always attached to your favorite veterinarian, nor does every cat owner have the luxury of the choice, given that cat-only hospitals are few and far between. But that doesn’t mean your cat has to suffer. Veterinary hospitals of all stripes CAN make your cat comfortable, despite having other species in their midst. Companion animal veterinarians are increasingly aware that high quality feline medicine means catering to cats’ creature comforts. That’s because higher feline stress levels translate into fewer veterinary visits (for wellness and illness, alike) when owners observe what they perceive to be deeply traumatic experiences. It’s also because we strongly suspect that the physiological state we call stress leads to poorer outcomes. In other words, we believe that stressed cats are less likely to recover from their diseases, more likely to succumb in surgery and suffer significant healthcare disadvantages across the board. That’s why the veterinary profession is in the midst of a “kitty makeover,” building new facilities and redesigning older ones to accommodate the behavioral peculiarities of our feline patients. We’re reworking protocols, divvying up our time and generally re-training staff in the ways of the cat. Curious? Want to know how your doc ranks? Here’s a top ten list of those ways in which veterinarians, their staff and their facilities can make a difference in this regard. Keep it handy so you can ask your veterinarian about these concessions (after all, they’re not always so obvious). 1. The waiting room: Is it big enough to make sure kitties in carriers aren’t continually sniffed? Is there a separate space where unruly dogs can be isolated? A quiet “kitty corner”? 2. The front-office staff: Is the reception staff aware when certain dogs are causing cats to freak? Do they appropriately step in and ask a dog’s owner to reel in their dog or enjoy a nice walk outside? 3. The kennel staff: Do they hoist the carriers heavy-handedly, swinging them about, or do they gently and smoothly carry your loved one to her predetermined location? 5. The noise factor: From your vantage point in the lobby or exam room, can you hear dogs barking from way back in the hospital ward or kennel area? If you’re blessed with a veterinarian who will let you tour the premises, pay attention to the volume in places where cats are housed. Is the radio blaring? 6. Sound technology: New hospitals now install sound-proofing in cat areas and throughout the hospital to preserve staff sanity and feline well-being, alike. 7. Separate spaces: Dedicated cat areas are all the rage––as well they should be. Though an ICU is no place to worry unduly about separating very sick animals, hospitals serve cats better when they can provide a quiet environment for ill and recovering kitties. 8. Scheduling: Smart hospitals with limited space will sometimes separate dogs and cats by scheduling them in at different times. Mornings for dogs, afternoons for cats, Mondays for dog surgeries, Tuesdays for cat surgeries, etc. It’s nowhere near foolproof––emergencies happen––but it can help. 9. Housing: Nothing fancy is necessary here. Those swanky, two-story “kitty condos” sure look nice but I’m not so sure hospitalized cats care. More room is not always what they want or need. Offering towels and blankets for hiding between treatments (when appropriate), beds or boxes to sleep in, and litterboxes (not all places offer these, believe it or not) is probably all they need––in addition to a calm, quiet environment, of course. 10. Odor control: If you can smell a dog, so can they. That’s why some hospitals use enzymatic cleaners to break down proteins, not just the standard OSHA-approved disinfectants. 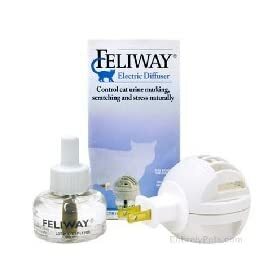 Feliway, a feline pheromone spray or diffuser, might be utilized for calming purposes. Some even dedicate an exam room or two to cats so that the area remains as untainted by canine aromas as possible. The really dedicated staff members will consider changing their scrub tops between dogs and cats for the same reason. OK, so now it’s YOUR turn. What does your vet hospital do to make your kitty visits and stays more relaxing?